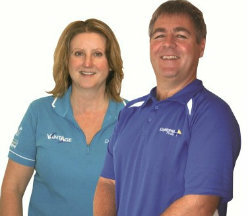 Stu Laing and Jan Cazemier introduced Compass Pools into New Zealand in 2003 as the licensed distributors for New Zealand. We set up a display centre in Christchurch and since then the brand has extended into Central Otago, Nelson, Wellington, Napier and the wider Hawkes Bay region, Tauranga and the Bay of Plenty region as well as Hamilton and the Waikato and soon to be Auckland. Our background in the swimming pool industry began in 1991, having been selling and installing spa and pool products from our retail/service centres located in Dunedin and Queenstown. We built concrete pools ourselves and carried out repairs on every type of pool surface and have extensive experience with chemicals and chlorination systems, heating systems and pool covers. “While our customers loved having a pool, they hated forever vacuuming/cleaning them and also complained about the cost and time to maintain and re-surface their pools. From our experience and after listening to what our customers where telling us Jan and I knew we had to find a product that was different and better than the rest. So we started our search for a pool that would address these issues. After 12 years in the industry we found Compass – an amazing family-based business in Australia who was selling up to 2500 pools a year to Australian families. Our first thought was “if they’re selling that many pools in a country where pools are so important they must be doing something right!”. We quickly learnt that the technology behind Compass Meant that they were cheaper, easier to run, safer, and cleaner. We decided to bring the Compass Pool franchise/dealership into New Zealand. Initially based from our retail/service centre in Queenstown where we were living at the time. The demand for a Compass Pool grew quickly and in 2005 we moved to Christchurch and established the Head Office there. We then sold our businesses in Dunedin and Queenstown and built the display centre in Christchurch in 2008.